Why reviving the live filibuster in the Senate is a terrible idea. When Congress convened earlier this month, senators Merkley, Udall, and Harkin introduced a package of proposals to reform Senate rules—including, most notably, the filibuster. But the proposal failed to gain traction in the Senate, and, on Thursday, Harry Reid and Mitch McConnell announced a deal that confirmed what reformers feared: the filibuster as we know it will remain. The big mystery for me in all this is why the reformers were so insistent in their package of proposals on forcing “live,” or “talking,” filibusters. Instead of the current practice, in which the minority serves notice that they intend to filibuster and the majority then either files for cloture (if they have 60 or more votes) or moves on to another bill, many reformers seem to believe that the key to a better Senate is, as was once the case, for the filibustering senators to hold the floor and talk indefinitely. I think this proposal is a mistake; forcing senators to talk won’t get reformers where they want to go. The mere threat of a filibuster could sometimes doom legislation, but to act on that threat, the bill’s opponents had to seize the floor and speechify themselves hoarse. This stopped being necessary in 1975 with the adoption of the “procedural” filibuster, which ended the filibustering senator’s obligation to hold the floor and thereby increased the filibuster’s use to the point where the number of cloture votes rose from 27 in 1975-6 to 50 in 1995-6 and then to 91 in 2009-10. But, as political scientist and Senate rules expert Greg Koger explains in his book Filibustering, what really changed was that floor time became more valuable for a variety of reasons, making attrition (that is, waiting out all the talking) as a strategy for defeating filibusters no longer desirable—at least, if the minority had more than a handful of supporters who had other business they wanted addressed. So cloture became the method used for defeating filibusters. Once that was the case, majorities rearranged rules and procedures to make it as easy as possible for majorities to function (and succeed). For example, the new tracking system introduced around 1970 allowed the majority to move on to a new bill even while a filibuster continued against another piece of legislation. Meanwhile, live filibusters still take place occasionally, but usually as efforts by single senators. What the Merkley-Udall-Harkin proposal would do, as I read it, is reverse these developments and make live filibusters the only show in town for a minority that wants to stall and defeat a bill it doesn’t like. But this would be only a mild inconvenience for the minority; its members would theoretically have to speak on the Senate floor for long periods of time, but that’s not really much of an imposition on them. On the other hand, it would seriously handcuff the majority, by bringing its entire agenda to a halt for hours, even days, on end. Put another way, nothing in the now-defeated proposal would change the logic under which attrition just doesn’t kill a filibuster. And, if attrition doesn't work, then forcing a live filibuster doesn't make any sense for the majority. Of course, it’s possible to change the rules and thereby make attrition a viable strategy. One proposal, put forward by political scientists at Binghamton University, would “allow a filibuster’s opponents to hold a cloture vote with little delay or warning.” This would make live filibusters very difficult to sustain because the minority would have to keep 40 senators available around the clock. I can’t imagine that senators would readily accept this comity-violating reform, but there are presumably other ways to change the rules to make victory by the majority during a live filibuster an easier prospect. The problem with such proposals, however, is that senators would see them as bids to eliminate the filibuster altogether (which they more or less are). So reformers would find themselves back at square one. Sure, there’s a case to be made for making a supermajority vote (i.e. cloture) necessary if and only if minority opposition is intense, and I support ideas for accommodating such situations. But it’s just wrong to equate intensity with a willingness to stand on the Senate floor and talk indefinitely. To the minority, this is an opportunity, albeit a difficult one, but not an overwhelming hardship. Senators, after all, like talking, especially if it gets them in the news. After the defeat this week, it’s time for filibuster reformers to regroup and prepare for a future battle, which may come soon if, say, Republicans choose to filibuster an inordinate number of judicial nominations. This time, the goal should be to find something smarter—a plan that will actually work to accommodate majority interests, minority intensity, and, in my view, majority intensity, too. Live, talking filibusters don’t have anything to do with those goals. 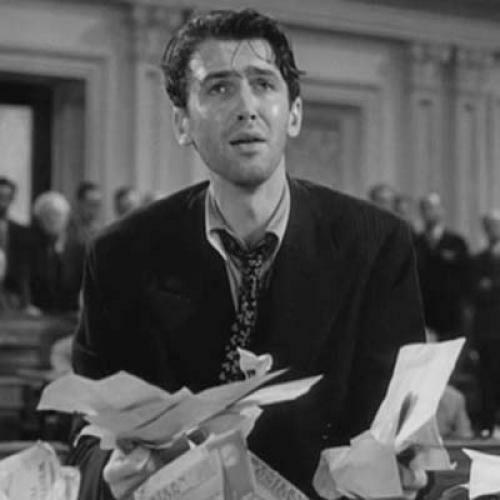 Nostalgia for Jimmy Stewart has its place, but Senate reform isn’t it.